Home › Diamonding › Why is asking questions a must for a modern leadership? Why is asking questions a must for a modern leadership? Have you seen a politicians or a CEO asking questions? I must say I have but it seams that this condition is so rare that it does take a memory exercise. Do you as a manager or leader of your team ask meaningful questions? How can this make a big difference in your work performances? I was observing people on leading positions this month, how they behave and what they do when facing the “crowd”. From governor Schwarzenegger in California answering questions on his Twitter panel, to a group of CEO and professors on a panel about creativity in business during the global entrepreneurship week. The first impression is normally Wow, these people are so wise, they have answers to all the question that come from the public. But should it really be this way? Most of our business and political leaders are repeating this big mistake continuously. Our school teachers and professors at the universities (those who mostly talk and don’t question) have contributed to the development of this attitude as well. This pattern, is deeply nested within the culture of the western world, where we project our power to our leader (father) and believe that because he is “up there” he is smarter, wiser and more capable than us. We therefore expect the answers and/or solutions to come from him only. In this way the “people” or the employees stay passive observers, do not participate and don’t take responsibility for their own action. On a national level, we often expect the mayor or the government to sort our street problems. The leader, “the big one” (the father) is responsible for all, therefore he knows all and he has answers to all. The public “the listener, the small one (the child) knows less, is less responsible and is waiting for the right solution, decision etc. to come from “daddy”. This is not only disempowering for the people who are lead, but creates unrealistic expectations and big burden for the leader (or the leadership team) to carry on his shoulders for a long time. This way does not encourage personal growth, and when there is no personal growth there is no organizational or systemic growth too. By answering and not asking meaningful questions, leaders are blocking the creativity, the collective insights and the wisdom naturally nested within the system to surface. This maybe serves a narcissistic purpose for the manager/leader but has no valid leadership, creative nor business value. Since he/she does most of the talking and is consumed in his “smart monologue”, the leader is not learning a thing from the pool of knowledge that has the most valuable information for him/her. The above method of leading by simply answering is old fashioned, it’s fear based with a power struggle in it and is not liberating energetically. Furthermore it does not support creativity and the regenerative natural flow of the system. The bottom line is that the teams/organizations that are lead by such managers and leaders have lower engagement, less creativity, possess fear based culture, are less productive and obviously they make less money as result of this. This is certainly not what we want. Now, don’t get me wrong, I like Mr. Obama , but he or any other business and political leader must start to ask more and more meaningful questions (key questions) and create supportive environment for the collective intelligence to come to surface. Leaders need to encourage open space communication where smart ideas from the people in the system unfold creatively and freely. They need to create powerful and meaningful questions that captivate the interest of the group, questions that have value for the people they lead. In such a way they will support the co-creativity, invention, cooperation on local and/or global level. [ii] This will also help them to share the massive responsibility needed to make the changes in their teams/organizations or nations. For the end let me“walk my talk” and stimulate your questions designing skills. I’ll ask some questions you may use for personal and/or on organizational level. To work on a personal questions find a partner or group with 2-3 people who would like to explore these or other meaningful question that matter to you. In organisational setting, with specialized facilitation, the size of these groups can grow up to several hundreds where teams can explore and design variety of performance and strategy issues. With right conscious leadership and the support of the social media platforms like twitter, key questions can reach millions. Do not try to answer the questions straight away, but rather hold the question for a certain period (few weeks to a month) and remind your self of it daily. What is my(your) life purpose? How could “I” contribute in my school, town….to humanity? How can I create supportive and inspirational relationships? How do I create excellence in life? Exercise 2: “7 Levels of organizational Inquiry”, taken from the book Diamond Leadership. What is my unique Purpose? How am I releasing the magic of the moment? How am I venturing into uncertainty? How am I focusing the power of my intent? How am I supporting growth? How am I learning to see the invisible? How am I returning my gift? How am I keeping my energy clear and bright? 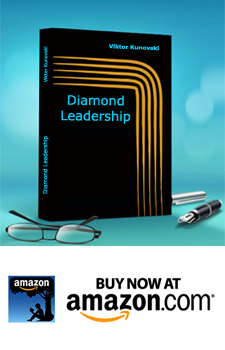 The themes I’ve been writing about in this blog are expanded in my latest book Diamond Leadership available on Kindle. ‹ How are you maximizing your social media as leadership and transformation tool? I applaud your ????? But let me take you back to our childhood years. Every parent applauds a questioning child- showing intelligence-, but sometimes a straight YES or NO was part of the deal, that’s just the way it was and is. We cannot cross when the light is red, no argument and eventually we will pass this message on. Leaders walk the line of the mission and objectives they have engaged themselves to and a straight YES or NO will be part of it. There will, fortunately, always be people who question decisions and keep leaders alert, and that is our task! Provide food for thought. Leaders send a message and we should send something back! A good leader has multiple eyes and ears. in my view, leaders need to ask questions because their job is to set a path for the future, which is inherently uncertain and unknowable. In these times of rapid evolution, it’s particularly important that leaders turn their attention outwards, frame up the critical questions, and invite everyone else (who are probably more in touch with the field) to sense what’s happening and needs to emerge. For me a leader’s job is to create the space and culture in which others will come up with answers and ideas, continuously. Like a watch that has stopped, the leader who purports to have answers can only occasionally be right. No one leader has all of the answers. Great ideas, innovations and solutions come from all levels of hierarchy. Engagement is absolutely required to develop an organizational learning culture and solidify trust among team members no matter how large the group. Without trust a decrease in productivity is inevitable and the ability to adapt to rapidly changing environments and opportunities will be missed. It is not just a matter of asking questions and maintaining conversation, but the level of transparency in the conversation and relationships. Assumption of understanding or meanings is a very costly problem. When questions are not asked, incorrect paths of change (for the desired outcome) are often followed. Once the question has been asked the answers provided should be listened to, responded to with respect for the intent of the offering and hopefully more questions will result. In the long run, this process generally results in higher quality output. That loop of questions & answers needs to be ‘managed’ or monitored to make sure that when a threshold has been crossed, with concurrence from the team the next phase of designing he change can begin. You have a really useful site. I have been here reading for approximately 40 mins. We are a newbie and ur understanding is very useful to me. I am glad the blog is useful to you. the best way to use it is to simply try someof the questions above. I am very happy to know that my work serves your purpose, this is why this site has been build and the book written. Since I am working on future writings, I am very interested to know what exactly are your challenges and what are your “key questions the the moment”? Key questions for creative dialogue - How to align your system? FEAR – how to metabolize the first enemy of man?